Path of the Wicked by Jennifer Stanley, a Mysterious Review. Review: Cooper Lee's church group volunteers to deliver meals to the needy in Richmond, a worthy cause indeed. But when the recipients begin dying, Cooper wonders if one of them is a ruthless killer in The Path of the Wicked, the second mystery in this series by Jennifer Stanley. Trish Tyler, of Tyler Fine Properties, is sponsoring a route for two months for Door-2-Door Dinners, a charity that delivers food to those in need. On each Saturday, members of the Hope Street Church Sunrise Bible Study Group pair off to make the deliveries as well as do small household jobs as necessary. But soon complaints start coming in that items are missing from the homes that were visited by the group. Then there are some unexplained deaths, of people just sitting in their chairs who were in otherwise good health. Mixing up the pairings, the group is put in the awkward position of investigating themselves, as if they are trying to find a demon within a group of angels. But travel this path they must, to put a name to a killer before another innocent soul dies. The Path of the Wicked is a pleasant inspirational cozy filled with average people leading average lives but striving to do good all the same. 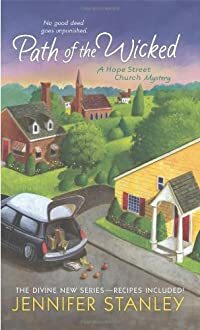 The satisfaction here isn't so much in solving the mystery — it's not all that complicated — but in participating in the adventure of Cooper Lee and her Bible study group as it goes about identifying the true culprit after the police have, of course, arrested the wrong person. This is a very good series for readers who enjoy a mystery plot, one with some action and a touch of romance, but without overt violence or objectionable language. Special thanks to guest reviewer Betty of The Betz Review for contributing her review of Path of the Wicked. Acknowledgment: Minotaur Books provided a copy of Path of the Wicked for this review.